For over 20 years, indigenous people of the Amazon have been using “Life Plans” to manage their forests sustainably, but most of them struggled to find the money needed to get the plans off the ground. Forest-carbon finance seemed to offer an answer, but REDD+ as initially structured in the voluntary markets didn’t always match indigenous values. Now, it does. 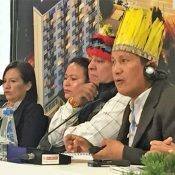 6 December 2018 | KATOWICE | Poland | “RIA lives!” said Peruvian indigenous leader Fermín Chimatani Tayori, referring to a private-public partnership called “Amazon Indigenous REDD+”, an eight-year effort to develop protocols and projects that use carbon finance to support indigenous development plans called “Life Plans” (Planes de Vida). RIA was initiated in 2010 by the Peruvian indigenous association AIDESEP (Interethnic Association for the Development of the Peruvian Rainforest), and it blends the carbon accounting of REDD+ (Reducing Emissions from Deforestation and Degradation) with traditional indigenous agroforestry strategies that conserve forest while producing fruits and other non-timber forest products. It also layers in recognition of collective land rights specific to indigenous peoples. Indigenous leader Juan-Carlos Jintiach formally announced RIA in 2011 at year-end climate talks in Durban, South Africa, and championed it in global climate talks as head of the Coordinated Indigenous Organizations of the Amazon Basin (COICA). When Jintiach stepped down, Tayori, who is President of Peru’s National Association of Communal Reserve Leaders (ANECAP), became its champion in global talks. The two men appeared together this week in Katowice, Poland, to outline the progress to date and to urge further expansion into forests beyond indigenous territories. Tayori says that his own people, the Amarakaeri, have implemented the REDD+ program across their territory, the Amarakaeri Communal Reserve (RCA), which covers more than 400,000 hectares in the Peruvian state of Madre de Dios. Critically, he adds, the project was implemented jointly with the state and federal government as part of Peru’s Climate Action Plan, or Nationally-Determined Contribution (NDC) to the Paris Climate Agreement. That, he says, had knock-on benefits for territorial governance beyond climate. Berioska Quispe Estrada, a specialist in Land Use, Land-Use Change, and Forestry within Peru’s Federal Ministry of Environment (MINAM), agreed, and said RIA could serve as a template for conservation projects across the country. Jintiach said the template could be spread beyond Peru, to indigenous territories across the Amazon. The Peruvian government hopes to attract carbon-based payments based on reduced rates of deforestation, and she says the money will go directly to the communities. I read an excellent article. We are collaborating with Mars in Asia, Papua New Guinea. We are a locally owned startup for forest, indigenous thrivability software. I am keen to exchange with you si lo quieres.